When I saw the fresh (or not-so-fresh) deli meat in the cupboard instead of the refrigerator a day after I used it, I knew. Yep, I had lost it. You know the ad where the family finds the keys in the fridge? I felt like the woman who put the keys in the fridge. Alarmingly so. Yikes! But I realized that most times, I’m just not where I am. For instance, on the day of the deli meat, I was making lunch and talking to my sons. Where should we go for a hike, was the topic of conversation. In my head, though, the thoughts ran like this: “Hiking…hmm…I should get more exercise. The dog, too. I wonder if anyone has let the dog out? Oh yeah…dogs…I should think about contacting my client about her dog painting. Then I could post it on Twitter. I need to check my Twitter account. In fact, maybe I’ll change my website up. Speaking of website, I saw a great recipe for stew on the internet. I’ll pull stew meat out of the freezer. Which reminds me. That tomato stained my shirt. I’ll start the laundry soon…” Mean while, I’m busily talking and listening to what is going on around me, as well as making the sandwiches. No wonder I put the meat in the cupboard! Be where you are. Use all your senses to live the moment. When I paint, I try to capture those moments from the chaos. Smell the flowers, taste the ocean spray, see the beautiful colors and patterns, engage all the senses. I live too much in the future, planning. Or in the past, fixing. Not really being where I am. This painting today is about being where you are. I’m capturing, for you and for me, that moment of brightness at Seattle’s Pikes Place Market. Can you smell the flowers? Hear the music and the voices? Taste the cookie sample on your tongue? These flowers glow with gorgeous patterns and colors. The woman arranging is surrounded by chaos, by color and sound. She is living in the moment. She sees flowers and patterns and arranges them thus so, engaged and absorbed in the details. 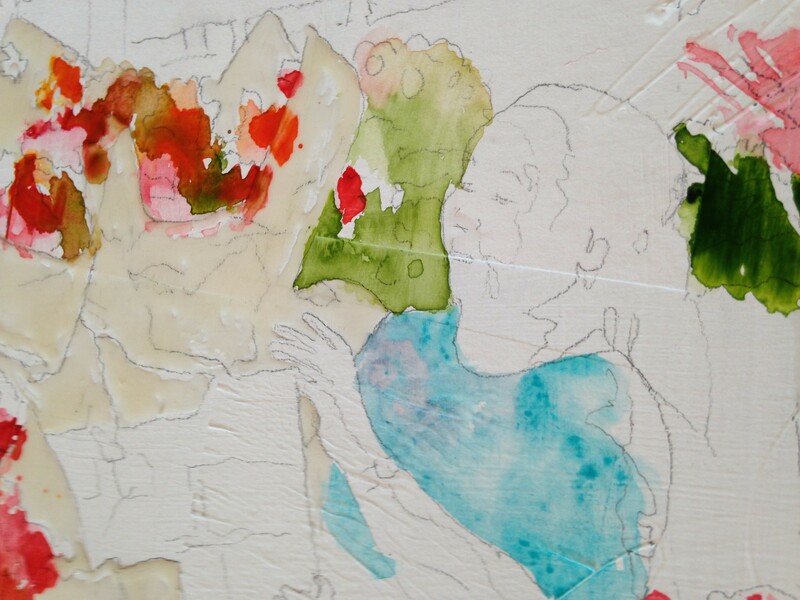 I’m sharing this moment with you as best I can, through my voice in watercolors. Enjoy. Think about being where you are. I’m trying. Maybe I will save on the grocery bill! 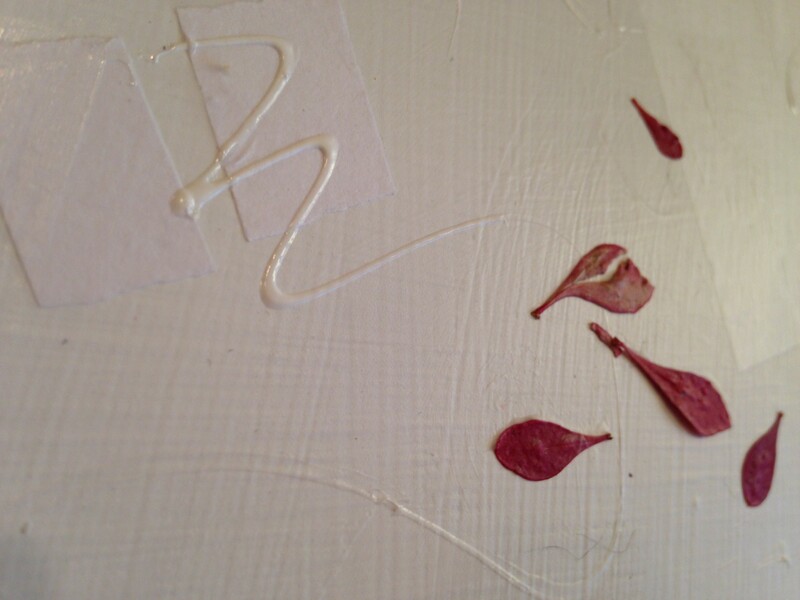 Flower leaves and fabric paint add texture to the canvas. 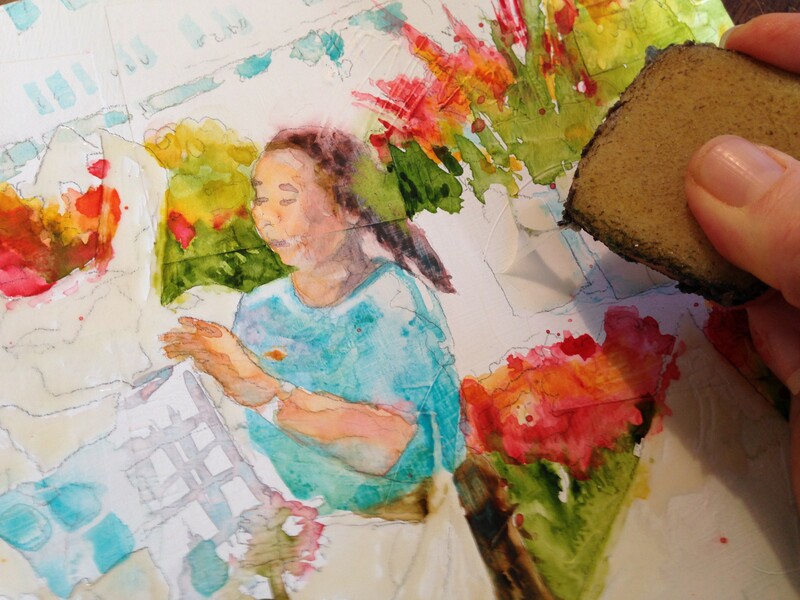 After the gesso and collage dried, I drew in the composition and began painting the beautiful flower vendor. The flower vendor detail, showing liquid mask on the whites of the tissue. Using a pallet primarily of green and red complementary colors, I painted the flowers around her. 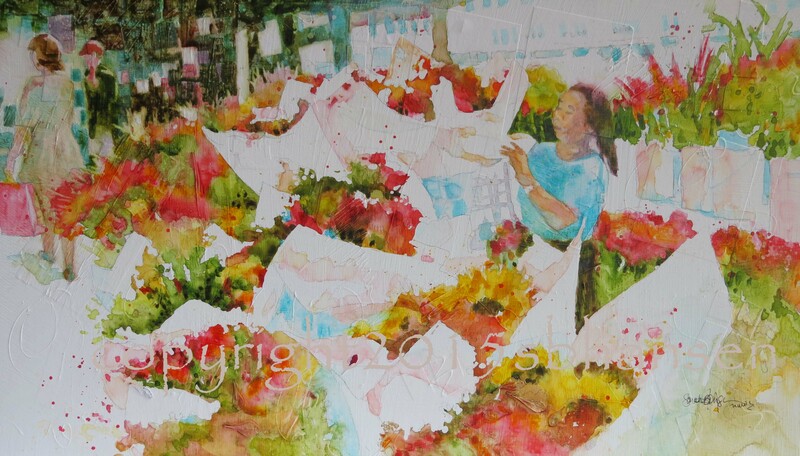 Detail of first wash, illustrating the flowers, shirt, and green stems around the flower vendor. 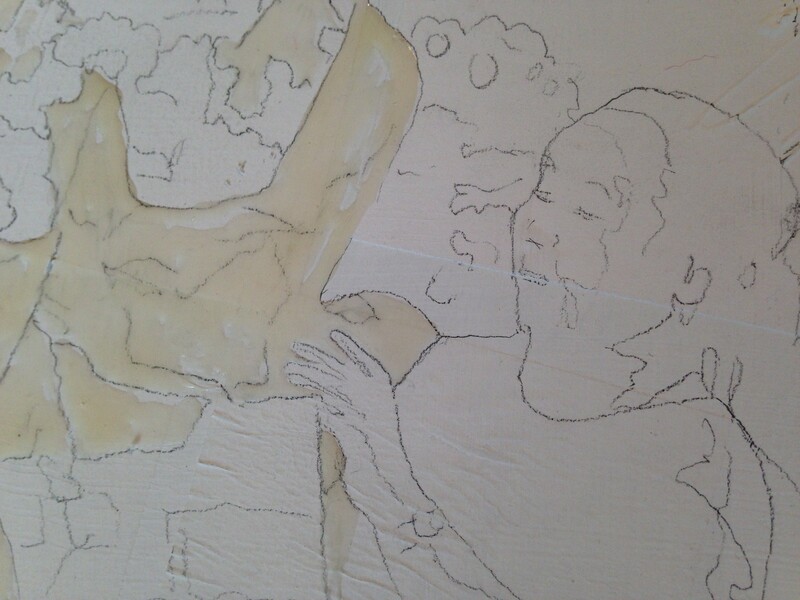 Adding more detail to the woman in the third wash. When I felt the painting was about 90% done, I removed all the liquid mask. Detail showing the removal of liquid mask. Almost done, I sat the painting in the living room and watched it for a week. Really. Things become clear as you glance at it now and then. Almost done. I set it aside for a week, wondering if I was completely done. I had propped it up against binoculars on the piano. When sun came through the window one day, the binoculars cast a shadow on the flowers through the front. Bingo! I saw what the painting needed. 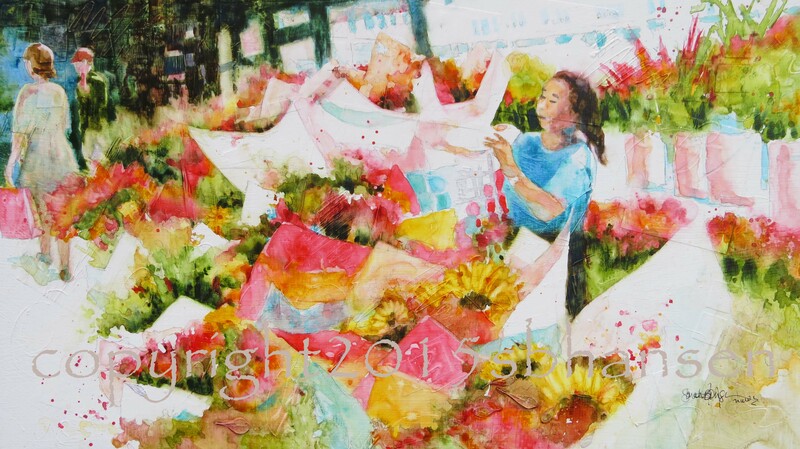 I painted the front white tissue a mid value to guide the eye to the focal point, the flower vendor. I also darkened the values in the back, especially around the woman shopping. Now the eye moves easily through the painting, with the whites forming an angled “T” from the lower LH side, coming up through the white tissue and background windows, and coming back down through the buckets and tissue on the right side. 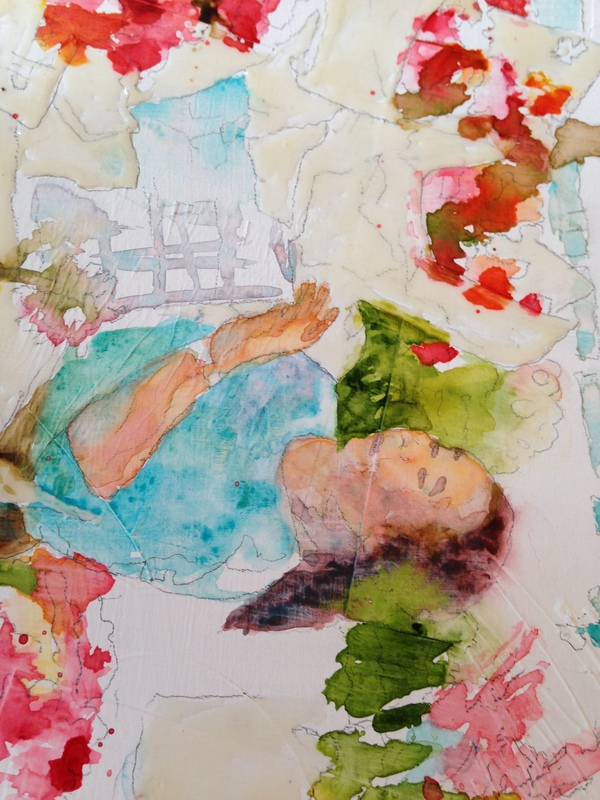 Joyful Surroundings, 11×19 watercolor on plexiglass. Available for purchase.